UMP | University of Minnesota Press Blog: What's next -- Pink Cigarettes for the Cure? Samantha King is associate professor of kinesiology, health studies and gender studies at Queen's University in Kingston, Ontario. She is author of Pink Ribbons, Inc.: Breast Cancer and the Politics of Philanthropy. This article first appeared on the Breast Cancer Action Montreal's Fall 2010 bulletin. Truth be told, I wouldn’t be surprised. After all, just last year Smith & Wesson released a breast cancer gun -- complete with interchangeable bubble gum pink grip. And gas stations across Canada and the U.S. regularly emblazon their forecourts with giant pink ribbons. Handguns? Gasoline? Hormone-inflated chickens? Known threats to public health are clearly not a primary concern for some breast cancer charities. Indeed, it appears that organizations like Komen may have lost sight of their core vision “to achieve a world without breast cancer” as they scramble to attract commercial sponsors. 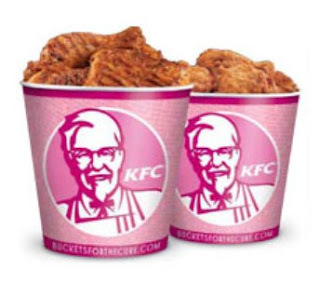 Perhaps because of a broader and frequently moralizing societal panic around obesity, as well as increasing recognition that food quality is an important component of good health, the Buckets for the Cure promotion elicited a quicker and more vexed response than other dubious endeavors brought to the North American public by the Komen enterprise. If high-fat diets are linked to breast cancer (an unsubstantiated but nonetheless widely held belief), what is the self-described “global leader of the breast cancer movement” doing promoting a fat- and sodium-laden product? Komen claimed that KFC offers a range of healthy menu options and placed responsibility squarely with the individual: “Consumers ultimately have a choice about what they will eat,” spokesperson Andrea Rader told NPR. More pointedly, Komen’s partnership with a corporation embroiled in a lawsuit with California over the use of a known carcinogen (PhIP) in the preparation of its chicken brings into question Komen’s legitimacy as an organization dedicated to saving lives. But KFC is likely laughing all the way to the bank. With the promise to donate fifty cents for every bucket sold (although the small print notes that “customer purchases will not directly increase the total contribution”), their fundraising target was $8.5 million. This means KFC would have had to sell 17 million pink buckets of chicken over the five-week campaign to reach its goal. (Just as well they were only committed to a minimum of $1 million.) As San Francisco-based Breast Cancer Action asked in its response to the promotion: “How much does KFC stand to gain from this campaign?” Couldn't KFC, owned by the world’s largest restaurant company, afford to donate this amount without making it conditional on a sales drive? If there is one glimmer of hope to be found in this story, it is that it has piqued the interest of a broad range of activists who might not otherwise have paid attention to the problems with breast-cancer marketing. It has also highlighted how the struggle against the disease is connected to other social issues. Some critics have pointed to the underserved communities Komen claimed to be reaching through its campaign and have asked why the foundation doesn’t instead partner with community clinics and other organizations concerned about the health of marginalized populations. KFC has a reputation for inserting itself in neighborhoods without grocery stores, where food insecurity is endemic. Wouldn’t Komen’s efforts be better channeled towards changing these conditions? Meanwhile, animal welfare advocates have drawn attention to the ghastly treatment of birds at KFC processing plants while other commentators have questioned the working conditions of those who process and serve these chemically-saturated avians. Does public outrage over Buckets for the Cure suggest that the sheen is slowly fading on the pink-ribbon marketing machine? I sure hope so. Find out more in Pink Ribbons, Inc., which includes a chapter on the National Football League's "Real Men Wear Pink" campaign as a national sponsor of the Susan G. Komen for the Cure foundation. Yep. Being beholden to corporate sponsors also creates an awful dynamic of making individuals responsible for not getting cancer and finding a cure if we do. If we cannot have an honest dialogue about possible - probable! - environmental factors that cause breast cancer, and we turn women into a pink army of beggars for the cure, how healthy and helpful is that? Support KFC because they support a cure, but don't actually EAT their food, because then you might be unhealthy and get cancer. But also, don't judge KFC for marketing cheap, convenient, and tasty food to people, because then you are really judging KFC's customers, saying they aren't smart/wealthy/savvy enough to know better, and you are depriving them of the possibility of awareness from a pink bucket of chicken. Sometimes, the price of corporate support is just too high.